The Pilgrims Annual Spring Supper took place in the Old School Room on Saturday March 9 2019 at 7.15pm. In order to commemorate the memory of Charles Eglington who died in 2018 and who made such a vast contribution to the Pilgrims cause the Committee decided to inaugurate a cup to be known as the ‘ Eglington Cup” to be awarded to an individual who has made a notable contribution to Pilgrims sport. 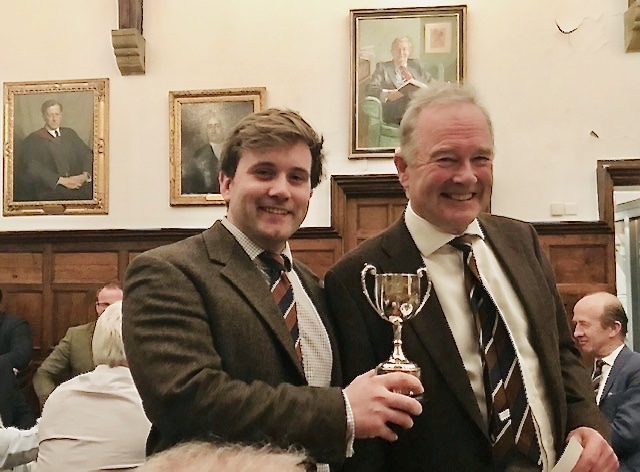 The first such award was made by the President Ed Lyons to Jamie Snudden (see photo below) on March 9 2019 for his outstanding contribution to Pilgrims rugby.